Hopewell's doctrine and practice are officially the historic, Reformed, Presbyterian doctrine and practice of the ARP Synod, as defined in the Standards of our church, namely the Westminster Confession of Faith and Catechisms (together with the Form of Government, Book of Discipline, and Directory for Public Worship). We rejoice that like our Synod as a whole, after an extended period of wandering, we are in the middle of what is now a several decade process of Reforming back to Scripture, in keeping with those Standards. Praise the Lord of mercy for His grace! This historical account was compiled by C. W. Bradley, September 1995 and revised in 1997, 2000 and 2005. Modified and updated by Dave Rentschler 11/23/12. Since then the congregation has been served by Pastor Homer L "Buddy" Roberts, who is now Pastor Emeritus, and James N Hakim (July, 2017 - Present). The Hopewell story began with the settlement of the area in 1806 by John Matthews ,James Hannah, W. Henderson, and John Baldridge, all of Mecklenburg County, North Carolina.The settlement was augmented by the arrival in 1810 of Samuel Scott and James Matthews. The latter were soldiers who survived the War for Independence. All of these men were of Scotch-Irish descent and worshiped in Associate Reformed Presbyterian congregations before moving west. The APR Church of today withdrew from the parent body in 1820 because of the drift of the eastern churches toward assimilation into the larger Presbyterian Church with its Yankee traits. (Wikapedia) The Associate Reformed Synod of the West maintained the characteristics of an immigrant church with Scotch-Irish roots, emphasized the Westminster Standards, used only the Psalms in public worship, was Sabbatarian, and was strongly abolitionist and anti-Catholic. These men established worship in their homes. The first ministers to preach for them were William Blackstock and Samuel Brown. Reverend Blackstock was an A.R.P. missionary who rode through Florida, Alabama, and Georgia, preaching the gospel before coming to Tennessee. He did this even though he was of advanced age. The Hopewell community was then known to the denomination as the Mission Station in the West. The congregation was organized into a particular church as part of First Presbytery, in the fall of 1820 by the Reverend Isaac Grier. There were 35 charter members. They worshiped in a building made of logs the same year. The first Ruling Elders to serve the congregation were Samuel Scott, Michael Baldridge, James Leech, and Robert Matthews. After organization, the congregation was occasionally supplied by the Reverends Blackstock, Brown, and Grier. The first pastor to be installed was Robert M. Galloway. Reverend Galloway served the church from 1825 until his death in 1839. A new building was completed the same year to replace the original log structure. The site of that building is located just west of the current driveway, near the large stones. J. K. Boyce became the pastor in 1844 and served four years until 1848. The church did not have an installed pastor for the next six years. It was supplied by J. L. Young and Reverend Parkinson, among others during that period. By 1851 membership had grown to 51. The present sanctuary was erected in 1854 after fire destroyed the second building used by the congregation. It was constructed by an itinerant builder who employed slave labor. The builder worked his way through the area during the years 1854 to 1856. The Reverend J. H. Bryson was installed as pastor during this period. By the time of the Civil War, membership reached 120 persons. Reverend Bryson left his charge temporarily to become a chaplain in the Confederate Army. During the war years services were often suspended when Federal troops passed through the area. One account states that Federal pickets were fired on in front of the church by a certain Joe Davis. After the war Reverend Bryson returned to his charge at Hopewell until he resigned in 1866. J. H. Peoples began a twenty two year pastorate in 1867. Church membership peaked at 150 members during his ministry. After that, the pulpit was filled by E. B. Anderson for a short time until J. M. White became the minister. He served until 1899. The pulpit remained vacant for nine years until 1908. Reverend White was followed by Lewis Hickman and W. C. Kerr. The Reverend C. B. Betts took the charge in 1911. His ministry at Hopewell lasted nine years. W. T. Simpson, H. B. Blakely, M. T. Ellis, and J. L. Boyd served successively with W. L. Latham preaching as the stated supply and then pastor from 1949 to 1950. The church was supplied by Lowry Walker of the Mt. Pleasant Presbyterian Church at times in the 1950's and W. M. Ford, after he retired as minister from Zion Presbyterian Church. T. L. Wilson held the pastorate for nearly two decades until 1972. He was followed by P. Missick, and W. C. Chartrand, who pastored the church during the years 1982-1990. C. W. Bradley served the congregation from 1991 until 2011 when he went to be with the Lord after a sudden heart attack on Thanksgiving day of 2011. By January of 2012, the church was being served regularly by Pastor Buddy Roberts as stated supply. In October of 2012, Hopewell extended a call to Pastor Roberts to serve as their full-time minister. In addition to the original four ruling elders already mentioned, the church has ordained and installed the following men to that office: Samuel Hanna, 1830; David Baldridge, E. Henderson, 1833; Robert Craig, James Davis, Thomas Galloway, 1855; Henry Harris, David Ralston James W. Matthews, about 1870; M. L. Harlow, Joseph H. Courtney, J. E. Walker, 1894; A. B. M. Walker, J. E. Henderson, and J. G. Matthews, 1917; John C. Galloway, L. A. Craig, and Albert R. Matthews, date unknown; J. L. Patterson, 1957; J. Boyd Cothran, about 1959 and Robert Bender from 2004 through 2009. The church is currently served by Active Ruling elders Jim Patterson, Charlie Mangum and David Rentschler. Johnny Boyd Cothran, Jr. Inactive. The diaconate is currently served by Sergio Youmans, Tim Heldman and Rick Seaton. The Hopewell Church is the only Associate Reformed Presbyterian Congregation to achieve permanence in Maury County. There was at least one other A.R.P. congregation in the western part of the county, near Cross Bridges named Union. It was about the same strength as the Hopewell congregation. The building there was destroyed by a tornado on March 21, 1835. It was rebuilt the following year, but sometime later the congregation declined until the church was disbanded. The Hopewell and Union churches were a yoked charge served by The Reverend Robert Galloway. Hopewell later was yoked with the Head Springs A.R.P.C. congregation in Belfast, Tennessee. The work at Belfast declined until it was discontinued (the sanctuary at Belfast remains standing). There was also a congregation of the Reformed Christian Church that resided in the Williamsport area during the early 1800's before they moved further west. In the early days, the Hopewell congregation hosted meetings of Synod four times, 1839, 1859, 1867 and 1874. It was just prior to the 1839 meeting of Synod that the pastor of the church, Robert Galloway, died (October 9,1839). He was buried the day before the Synod convened, with most of the delegates present for the burial. Although the Reverend W. C. Kerr lived with two of the church families during his tenure as pastor which began in 1900, the church provided a manse for its minister. Located on the church property, the first manse was completely destroyed by fire in January of 1981. The congregation purchased a house on the Pulaski Pike in the McCains community to replace it. It was extensively remodeled in 1991. This house was the residence of two of the Hopewell ministers, Warren Chartrand and Charles Bradley. The McCains house was sold in order to relocate the manse to the church property during the summer of 1995. The current church building was dedicated on April 5, 1857. The sanctuary was originally lighted by gas lamps. The large windows in the sanctuary provided light and ventilation. Large shutters were once used to protect the congregation from the summer sun and the glass from severe weather. Heat in the winter was provided by two large coal-wood stoves, whose flues joined together before exiting through the roof. The balcony, at one time, contained pews thought to have been used in one of the earlier church buildings. These pews where numbered and designated the seating for the slaves who worshiped in the antebellum years. 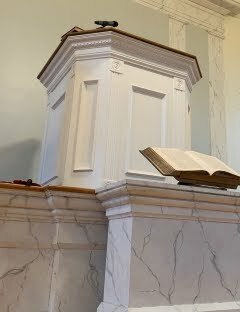 The facade behind the pulpit exhibits the work of itinerant painter who painted the wood to resemble white marble shortly after the building was constructed. Originally pews where divided as the men and women were segregated during the worship. This custom was abandoned early in this century. The interior of the building was originally finished with hog's hair and mud plaster. Remnants of it can still be found in the stairwell leading to the slave gallery. During late 1950's a large piece of plaster fell from the ceiling just after the minister had left the pulpit at the conclusion of worship. The offering plate was shattered by the debris and was subsequently re-glued. An acoustical tile ceiling replaced the plaster a short time later. The current refurbishment of the sanctuary began in 1992 when sheet-rock was used to replace the decaying plaster on the walls, and with the restoration of the sanctuary windows a short time later. In 1999 central heat and air conditioning was installed in the building. The arrival of the new millennium brought a flurry of activities aimed at maintaining and enhancing the building. The steeple was refurbished, the exterior of the building painted, and a narthex was created under the slave gallery by the addition of a soundproof wall. In September 2012, more renovations took place: A new floor was laid on top of the existing floor as well as the old pews being replaced by new ones. The narthex was painted and the bottom quarter of the sanctuary walls were painted with a chair rail added. The Estey reed organ was purchased near the end of the last century. The A.R.P. Church held to the Puritan tradition of exclusive psalmody and non-instrumental music until that time. The decision to purchase the organ was not an easy one for the congregation nor was it unanimous. Although the organ has been refurbished and supplied with an electric blower, a piano was added in 1991 and now supplies the instrumental music for worship. The Hopewell Church is the last remaining congregation in the A.R.P. Synod to regularly use tables in its communion service. During the sacrament communicants sit on long benches around long tables built for the purpose. Seated together, they are served elements by the elders. A common cup is still used, although individual cups are offered as an alternative. At one time the church practiced closed communion among its own members. Communion was later opened to members of other fellowships. A Ladies Aid Society was organized on August 24, 1886. Mrs. Margaret Walker served as president of the group. The Ladies Aid Society was responsible for regular contributions to home and foreign missions. They were instrumental in financing the building of the A.R.P. Church's building in Tampico, Mexico. In addition, they re-carpeted the sanctuary, purchased the organ and paid for half the cost of the first manse. All of their contributions to the church take on added significance when it is realized that they occurred during the period of reconstruction after the Civil War. The Ladies Aid Society of Hopewell continued to be an important part of the church into the middle of this century. The Hopewell Church is the oldest church in the Tennessee Alabama Presbytery. The Presbytery was formed by action of Synod on September 27, 1881, that consolidated Tennessee Presbytery with some of the Alabama Churches that were part of the old Second Presbytery. 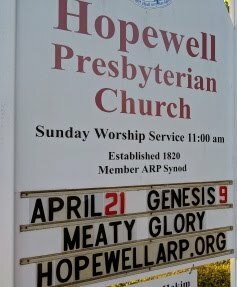 Hopewell hosted the first meeting of the Tennessee Alabama Presbytery on April 21, 1882. The Hopewell Church commemorated its centennial in 1920. A cake made in the shape of an open Bible was served. W. T. Simpson spoke in the worship and District Representative L. P. Padgett spoke in the afternoon. A sesquicentennial celebration was held in 1970 with a dinner on the grounds after the worship. The congregation celebrated its 175th anniversary with a display of historical artifacts, special worship conducted by the moderator of the synod, the Reverend Mr. Allen Derrick, and a concert by the Giles County Men's Choir. The Hopewell Cemetery was added to the church property in 1916. Elder J. E. Walker was the first person interred there. Previous to that time, members of the Hopewell community were buried in what is now known as the Matthew's Cemetery on the Sowell Hollow Road. The large maple trees surrounding the sanctuary were planted by Lindsey Matthews early in the 1920's. These trees were removed because of safety issues around 2009. New ones were replanted shortly thereafter. The sessional records for most of the years in the history of the church's existence have lamentably been lost. The earliest records were burned in a house fire. The Lord was pleased to call one missionary from the Hopewell congregation. Mrs. A. J. Ranson (Kate Walker), who went to India with her husband and family early in 1910. The steeple was refurbished late in the year 2000. During the renovation several large caliber bullet holes were discovered in the cedar post that served as the spire. The Hopewell Associate Reformed Presbyterian Church is committed to building on its rich heritage of Reformed worship and service. By God's sovereign grace we look forward to carrying the ministry that began so long ago, and that has been so carefully maintained, through the next millennium for the glory of Christ.